This recipe for skillet potatoes is one of the fastest ways to create an impressive side from pantry staples. 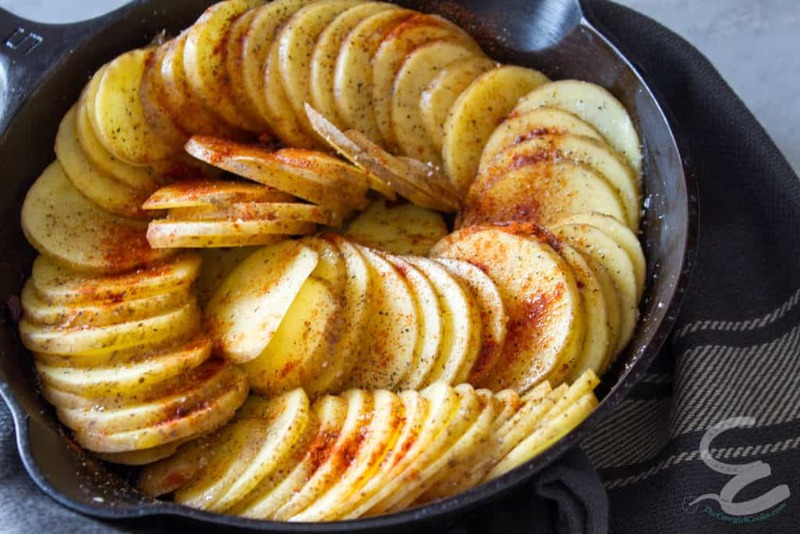 All you need for skillet potatoes is five ingredients, and two of them are salt and pepper! Spring has arrived on the prairie and Yeti and I are working our tails off to get a good start on all of our outdoor projects. Yeti and I just built a house over 20 miles from the nearest grocery store. We have so many projects to be completed, I don’t think I could list them all if I tried! There is fence to put up, watering fountains for the livestock to be installed, a garden to be put in, our garage is just a foundation with a cement floor, and the ground behind our house actually slopes toward our house. So any rainfall flows right back to our foundation. All of this work is being done by us – and we both have full time jobs. It’s enough to make anyone question their judgement in taking on such a large project. We just got a starter tractor that is older than we are. Yeti has been spending all of his spare time moving dirt and fixing our grading issues the easy way – while nursing a back injury. I get to operate the old-fashioned shovel and do the hard work. The things we do for love?! I can’t wait until everything is ready for my horses to move to our new place. One step at a time though. Between projects and trying to get my horses back in shape for summer, I don’t feel like we have much time to eat – let alone cook! (When company stops by, I have to figure out what to cook with what I have. A trip to town will be an hour in drive time! I love to cook, truly! Especially when Yeti and I aren’t overwhelmed with projects. Every year when spring shows itself on the prairies I know my time time in the kitchen is limited. After a long winter I love to get outside with the horses and dogs. My stomach is what reminds me that I should probably eat something, then it is too late to make an elaborate meal. I want something instantly! Celiac disease doesn’t make that easy, or cheap. Summer time socializing is severely limited for me too. 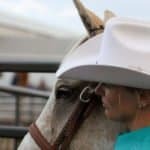 My friends and family know that if they don’t show up to an equine event, help me out in the garden, or work with me, they will never see me. Catching up is limited to talking on my cell phone during my commute. ( Don’t judge, It’s a long commute and the traffic consists of cattle, deer, pheasant, wild turkey and coyotes for the majority of the way). When we do get together with people, food needs to happen in a hurry. Grilling is often a go to – but not always. I refuse to serve bad food. Life is too short to eat boring food or ride ugly horses. I give bonus points for pretty food. Skillet potatoes definitely get bonus points. These tasty potatoes never last long. My favorite part about this dish is that all of the ingredients are pantry staples. I use potatoes, olive oil, salt, pepper and some paprika for an extra pop of color and flavor. You can use instead of olive oil for even more flavor. When pressed for time, a mandolin will will make short work of slicing the potatoes. I can slice five big potatoes in minutes, and they are all the same thickness. The mandolin ensures all of the cook evenly. If you don’t have a mandolin, a knife will work too. Prep time might take longer though, so plan accordingly. 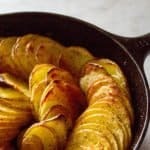 You don’t necessarily need a skillet to make these potatoes, but remember what I said about pretty? Any oven safe dish will work. Unfortunately, I can’t offer advice on sizing other than be sure your pan is small enough that your potatoes can be arranged in that pretty spiral. Yes, squares can spiral too. If your potatoes fall down you will end up with something more like a casserole. This tasty side looks glamorous spiraled into a cast iron pan, cooked to crispy perfection with butter and spices. 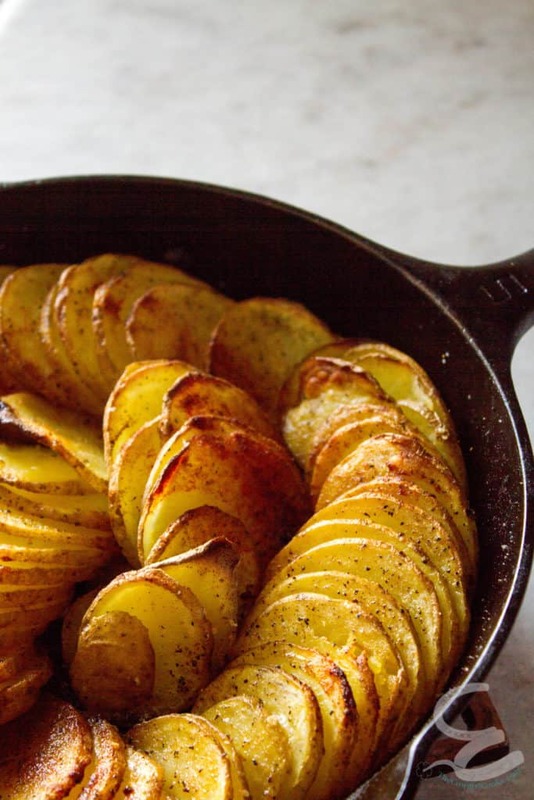 Arrange potatoes into a spiral in an oven safe 8″ cast iron pan or round baking dish starting on the outside and working your way to the center. 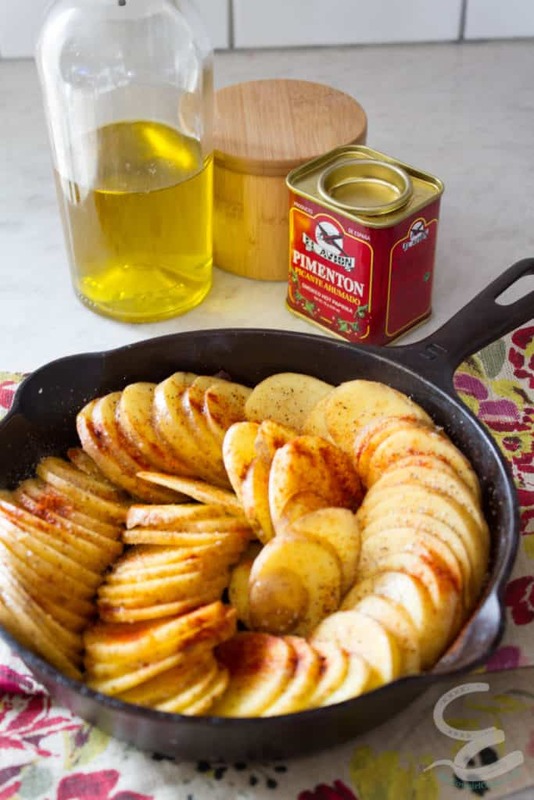 Drizzle olive oil over the potatoes then sprinkle with paprika, salt and pepper. Bake at 400F 25-30 minutes or until the potatoes are fork tender and well browned. If you don’t have a cast iron pan, this could be baked on a sheet pan. I’d reduce the cooking time.